Ford is slowly but surely adding a touch of green to its trucks. Americans seem to be slowly accepting the idea of hybrid and electric cars. What they may never accept is a hybrid/electric truck. There&apos;s a laundry list of reasons as to why eco-friendly pickups are hated. Not powerful enough, not powered by gasoline, a limited range-the list goes on. Despite all of the hybrid truck detractors, Ford is planning to add hybrid pickups to its lineup in the near future. A few of the Ford&apos;s future and past electric and hybrid trucks can be seen below. The times they are a-chaingin&apos;. Ward&apos;s Auto has reported that Ford is collaborating with Toyota on developing a hybrid F-150. The news that a hybrid F-150 is in development isn&apos;t much of a shock, but the fact that Ford is working with Toyota is. Ford plans to use the hybrid technology in both the Lincoln Navigator and Expedition, with Toyota planning to launch a hybrid Tundra and Sequoia. Odyne Systems has developed an aftermarket hybrid conversion kit for the massive F-750. The $100,000 add-on is meant to help companies cut how much they spend on diesel fuel. Odyne Systems estimates that its hybrid F-750 can save up to 1,750 gallons of fuel per year. The year 1998 saw the introduction of an electric Ford Ranger. The Ranger EV was given a limited release; a mere 1,500 were made between 1998 and 2002 and nearly all were leased .The rear-mounted electric engine was powered by either a lead-acid battery or a nickel-metal hydride (NiMH) battery. The NiMH battery offered a greater range than the lead-acid battery (65 miles compared to 50 miles) but suffered from numerous problems when it was first released. You might remember this F-150 EV created by Protean Electric for SEMA 2008. Protean Electric&apos;s truck is powered by four in-wheel electric motors weighing a mere 68 pounds apiece. Each electric motor is capable of producing up to 112hp and 608 lb-ft of torque. The truck is said to drive just like a normal F-150, albeit a lot quieter. Odyne Systems isn&apos;t the only company that builds hybrid heay-duty Ford hybrids. Azure Dynamics also creates plug-in hybrids for Ford, focusing its attention on the F-Series Super Duty trucks. 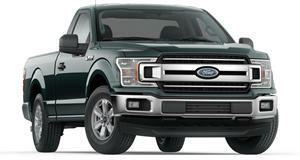 The company plans to release hybrid F-350s, F-450s and F-550s through Ford Commercial Truck dealerships starting in 2013.